“It is a blessed thing for a country such as the Philippines to have nurtured so maglny artists gifted in the various artistic fields. In the visual arts, I have personally seen the gradual maturity of one such artist, starting many years of serious work, experimentation and studies. 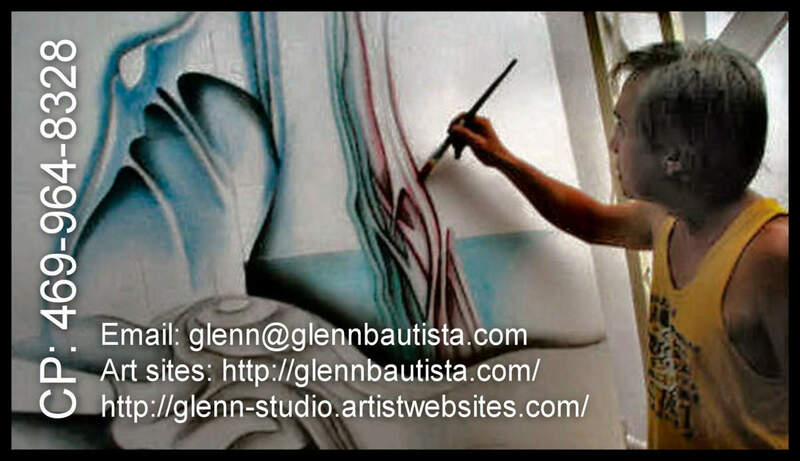 Glenn Bautista is his name, a signature that would soon be affixed on many superb masterworks gracing private and institutional collections. In a letter written to the artist at the young age of twenty four, our esteemed Secretary of Foreign Affairs, Carlos P. Romulo, lauded Bautista with compliments which have proved to be prophetic. “You have a brilliant future ahead of you . . . I believe you are destined to be one of our greatest in painting.” Not only has Bautista lived up to the expectations of a demanding audience, he has evolved his art into more complex visual directions, surprising in the assertion of an impressive technique and the audacity of his dazzling images. Since the first Glenn Bautista painting I acquired over two decades ago, I have sustained my patronage of his art, and shared my enthusiasm with other fellow collectors. Since May 2009 (my arrival in Garland, TX from the Philippines), I already started making our car my office where I would work on the books, now available online. My wife, Lorna, would average 40 minutes for each home-care patient. We leave our place around 6:30 A.M. and come back home, most of the time, before it gets dark. We both did this from 2009 until 2012. It is only now that Lorna has landed a job, at Ben Taub, as a physiotherapist, here in Houston, TX in a hospital setting. Lcristina Bautista, Lorenzo E. Gabutina, Romy Garcia, Danny Hernaez, Mitch Samonte, Teresa Liceralde Elloso Celdran, Imelda Cajipe Endaya, Ruby Lopez Refuerzo, Vics Magsaysay and 7 others like this. Thank you, Ka Juan . . the good Lord continues to show me the way, the truth and the life, as the verse we all know says, despite myself. God bless, my friend. Juan Riingen: Congratulations my friend. We’re honored having one internationally renowned Filipino Artist like you.